Samson, a Colourful Journey ~ | Jennifer Pratt Equine Artist. 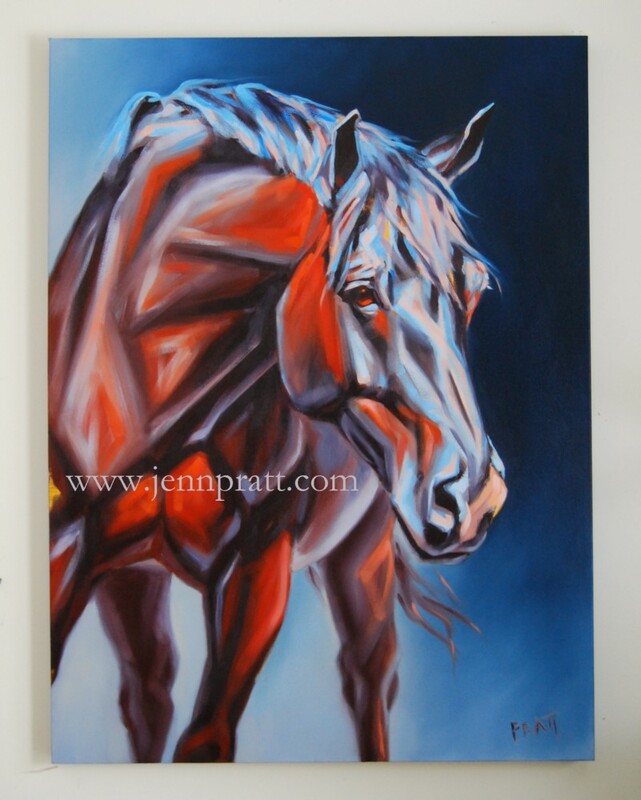 Last summer I met a client who was drawn to my colourful, painterly explorations of the equine form. In our commission interview, she to me said; “I would like something different”. I was of course thrilled to hear this because while I still have a love for carefully rendered realism, the other side of me wants to play, explore and be free with the brush. Finding a balance in the studio is healthy and rejuvenating. 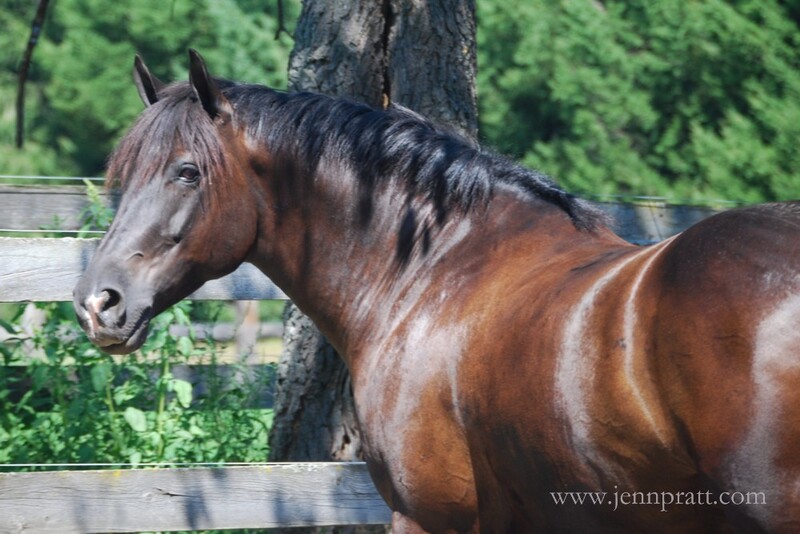 My journey with Karen’s horse Samson started out with a long photo session on a hot day…I’m laughing thinking back to this day because Samson, a PercheronX had more interest in eating and chilling out in the shade than getting his pictures taken. We persevered, and he finally showed us, what a handsome model he could be. When I began my studies for his painting, I happened to grab a dented tube of Cadmium Scarlett at the art store the week before. Dented tubes are 20% off and Cadmium Scarlett is a series 4 pigment ($$$) Score!! !..and no, I did not dent the tube myself 😉 Here I was itching to play with it, and a client who loves colour. I toned a canvas panel Cadmium Yellow Light and focused on a complementary palette of Cadmium Scarlett and Winsor Blue. Two equally powerful complements. When I wanted to lighten the values I moved up the colour wheel on both ends. My end palette only had six colours plus white. Cadmium Scarlett, Cadmium Orange, Cadmium Yellow Light and the complements Winsor Blue, French Ultramarine and Ultramarine Violet. In my head, I envisioned a playground of complements! each colour reverberating against, yet with each other. I felt the painting was successful, as not only did it capture Samson, but the colours were working together to create something with zing and pop…and yes, something different. Karen gave me the okay and told me ‘Go as BIG and as BOLD as you CAN’ with her final painting…I think I messaged her back, telling her that I loved her..lol..as not all commissions will give you such freedom. If you too are an adventuresome client – I have one colour study in this same palette available for purchase, from my ‘rear view’ series: *update* now SOLD, thank you! Wow, your work is beautiful. I just happened upon your blog and love your work. Actually, I think I actually like the painting before you “finished” it. The chunky feel of the brush strokes are really interesting. You should think about playing with that! thank you Bethany – it is always a fine line with overworking something isn’t it? I would like to do some more bigger and bold works for myself..but it will have to wait until I wade through a few more commissions.